Propolis (sometimes called “bee glue”) is the super‐sticky, gooey material gathered by the bees from trees and plants. The bees use this brown goop to fill drafty cracks in the hive, strengthen comb, and to sterilize their home. Propolis has remarkable antimicrobial qualities that guard against bacteria and fungi. Its use by bees makes the hive one of the most hygienic domiciles found in nature. This remarkable property has not gone unnoticed over the centuries. The Chinese have used it in medicine for thousands of years. Even Hippocrates touted the value of propolis for healing wounds. In addition, propolis has been used for centuries as the basis for fine wood varnishes. When cold, propolis is hard and brittle. But in warm weather propolis is gummier than words can express. When you inspect your hives at the end of the summer and early autumn (the height of propolis production), you’ll discover that the bees have coated just about everything with propolis. The frames, inner cover, and outer cover will be firmly glued together, and they’ll require considerable coaxing to pry loose. You’ll get propolis all over your hands and clothes, where it will remain for a long, long time. It’s a nuisance for most beekeepers. But be sure to take the time to scrape it off, or you’ll never get things apart next season. Be sure to save the propolis you scrape off with your hive tool! It’s precious stuff. Keep a spray bottle of rubbing alcohol in your supply box. Alcohol works pretty well at removing sticky propolis from your hands. But, for goodness sakes, keep propolis off your clothes — because it’s nearly impossible to remove. Many beekeepers encourage the bees to make lots of propolis. Special ­propolis traps are designed just for this purpose. 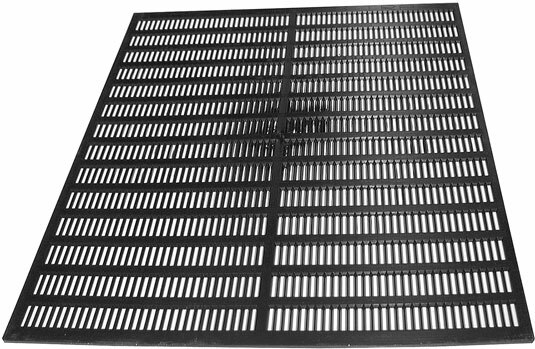 The traps usually consist of a perforated screen that is laid across the top bars — similar to a queen excluder, but the spaces are too narrow for bees to pass through. Instinctively, bees fill all these little holes with propolis. Eventually, the entire trap becomes thickly coated with the sticky, gummy stuff. Remove the trap from the hive (gloves help keep you clean) and place it in the freezer overnight so that the propolis becomes hard and brittle. Like chilled Turkish Taffy, a good whack shatters the cold propolis, crumbling it free from the trap. It then can be used to make a variety of nifty products. Here’s a homemade and all‐natural alternative to iodine. Like iodine, it stains. Use it on minor cuts, rashes, and abrasions. Some folks even use a few drops in a glass of drinking water to relieve sore throats. Measure the crumbled propolis and add an equal measure of 100-proof vodka or grain alcohol (for example, one cup propolis and one cup alcohol). Place in an ovenproof bottle with a lid. Heat the closed bottle in a 200-degree (Fahrenheit) oven. Shake the bottle every 30 minutes. Continue until the propolis has completely dissolved in the alcohol. Strain the mixture through a paper coffee filter or a nylon stocking. Bottle the tincture into dropper bottles, which you can get from your pharmacist. This ointment can be applied to minor cuts, bruises, and abrasions. Melt the ingredients in a microwave or in a double boiler. Remove from heat and stir continuously until it cools and thickens. If you happen to have a multi‐million‐dollar violin made by Stradivarius, you already know that the finest string instruments ever made had a varnish made from propolis. But this superior lacquer need not be reserved for such exclusive uses. Propolis varnish provides a warm, durable finish for any wood project. Here’s a recipe from a friend of mine who refinishes museum‐quality violins. Combine all ingredients in the following list in a glass jar at room temperature. Cover the jar with a lid. Allow mixture to stand for a week or more while shaking at regular intervals. Filter solution through a few layers of cheesecloth or a nylon stocking before using. The manila copal resin is available from specialty varnish suppliers, such as Joseph Hammerl GmbH & Co. KG, Hauptstrasse 18, 8523 Baiersdorf, Germany.